When deciding on your garage floor coating, you need a combination of both aesthetic and durability. If you are struggling to find a selection that works for you, Ohio Garage Interiors will have exactly what you need. Ohio Garage Interiors can give your garage the upgrade you’ve always wanted. They specialize in the installation of garage floor epoxy, cabinetry, and organization systems. Garages are inherently high-traffic areas. They are highly susceptible to wear and tear; therefore, your garage flooring needs to be durable and resilient. Ohio Garage Interiors offers garage floor epoxy coatings with flexibility and durability that outperforms competing products. These coatings offer strength and longevity; furthermore, they are non-porous, stain-resistant, and easy to maintain. Unlike other coatings on the market, Ohio Garage Interiors’ garage floor epoxy does not need annual maintenance. Why Choose Ohio Garage Interiors? The epoxy coatings from Ohio Garage Interiors have many advantages relative to DIY coatings. DIY coatings have an unfortunate tendency to breakdown and deteriorate soon after application. Many people use DIY coatings for the sake of cost-effectiveness; however, Ohio Garage Interiors’ garage floor epoxy bonds to the concrete, creating cost-effectiveness through longevity. Furthermore, they offer a ten-year warranty for peeling or damage, allowing you to rest easy for many years. 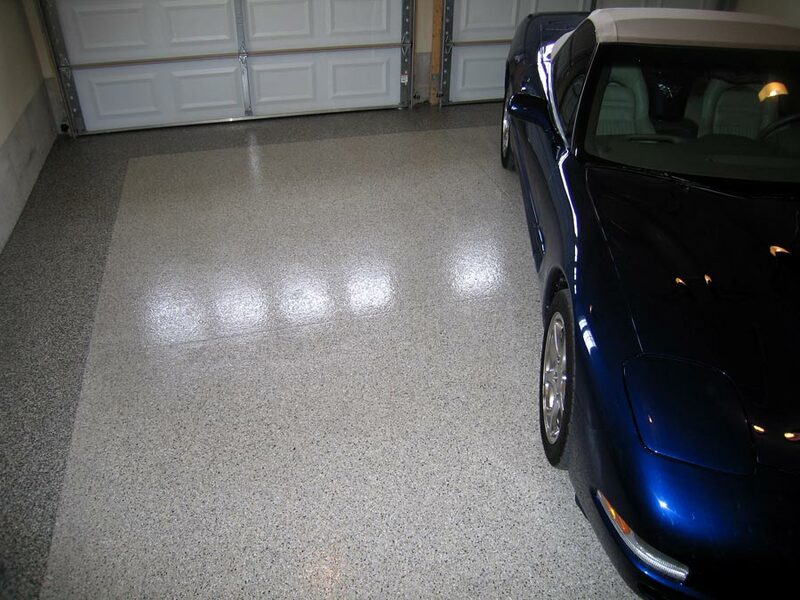 Ohio Garage Interiors’ garage floor coatings are also UV resistant and slip resistant. They have a beautiful finish that defends against spills and stains; thus, cleaning your garage floor has never been easier. A simple mopping or hosing is enough. In addition to the durability of Ohio Garage Interiors’ coatings, they also have a myriad of colors and styles to choose from. With Ohio Garage Interiors, you can customize your garage until it fits the image you want. They offer a diverse selection of color options for their decorative flakes, and they also offer different types of flakes: standard decorative vinyl flakes, variegated vinyl flakes, and organic mica flakes. These vary in sizes from 1/8 to 1/2 inch. Ohio Garage Interiors also offers solid-color and metallic finishes. The solid-color options come in many colors with a high-gloss finish, and there are options for customers to make custom blends. FlexTile Modular Flooring is another option for Ohio Garage Interiors’ customers. This type of flooring contains recycled tires and offers high longevity. FlexTile flooring leads the industry in quality and versatility. It functions well both indoors and outdoors. Furthermore, Ohio Garage Interiors can install this system in your garage, hanger, showroom, or even on your patio. The FlexTile Modular Flooring system gives customers countless customization options. With Ohio Garage Interiors, you can turn your garage into a beautiful showroom with custom flooring and cabinets. Their products can withstand even the harshest of garage environments while maintaining their pristine aesthetic. Even though the garage is the most common entryway into the average home, it is often neglected; however, Ohio Garage Interiors can make your garage both pleasing to the eye and practical. If you are looking to upgrade your garage, look into the garage floor epoxy coatings and cabinetry at Ohio Garage Interiors.